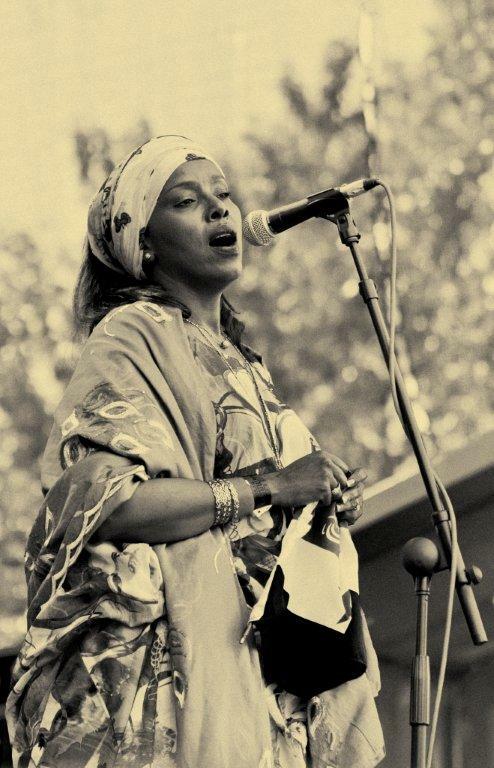 Sahra Halgan is an emblematic artist from Somaliland, a territory situated in the north of Somalia. Hersongs, inapureun-artificialmusicalform, show the world of Somaliland people, their sufferings and joys. Sahra's engagement gave her the status of symbol of liberty among the Somaliland diaspora. She is spreading the message of recognition of her country, for stability and against violence. Great-granddaughter and granddaughter of traditional singers, Sahra has been singing the repertoire inherited from her ancestors since her childhood. She definitively settled in France more than 20 years ago and she is now a proud French citizen. Her unique and atypical vocal identity has largely contributed to her recognition. Characteristic of the territories of eastern Africa, where the influences of the Middle-East and of Africa are intermingling, her voice surprises by its suppleness, its timbre and its originality; combining throat-voice, tribal inflexions, ululations and oriental ornamentations. Since her arrival in France, Sahra has staged her atypical route and her musical family inheritance with the complicity of African musicians settled in Lyon. After the release of her first album in 2009, she has covered the stages of Europe and in many countries. Sahra sings with nostalgia, a bit like Cesaria Evora (Green Cap) did. With lightness and in shows full of emotions, she becomes a vibrant echo singing love and peace. On stage, this great east African voice, with an incredible stage presence has a gift to take the audience to a unique journey where good mood and shared smiles are blending… Today, Sahra lives in Hargeisa, the capital of Somaliland and continues to pursue her artistic journey.